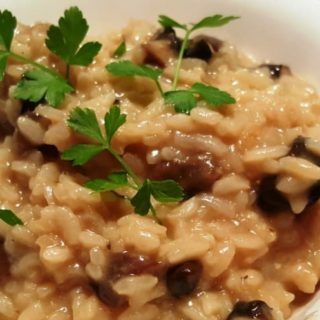 Instant Pot Mushroom Risotto is so easy to make in a pressure cooker. No more standing and stirring and your taste buds will dance with glee. 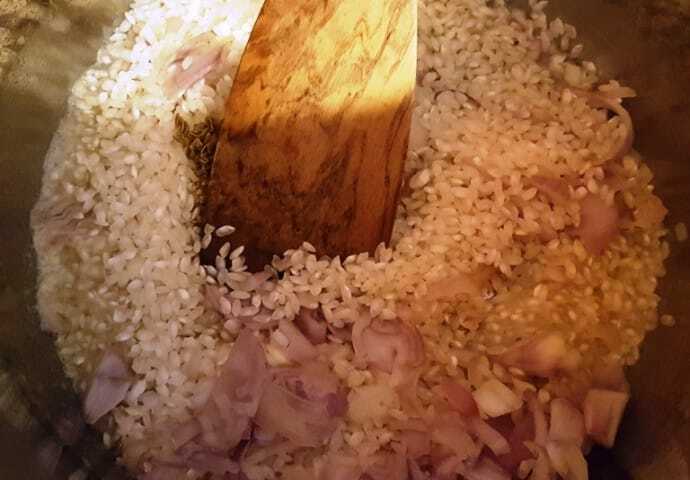 The first time I made Risotto was in my Wolfgang Puck Pressure Cooker, about 12 years ago. I had always heard how much work Risotto is on the stove top. All the stirring and adding liquid and stirring. Sounded like too much trouble. So, I decided to try my hand at a Pressure Cooker version. Little did I know, that my first try would be the recipe that I would use for years to come. If you just bought the new Instant Pot DUO MINI 7-in-1, this recipe is perfect to break in your new baby. 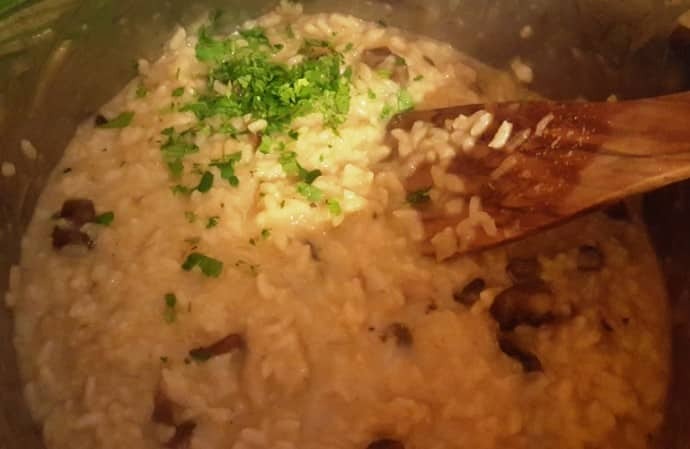 I had a big container of Wild Mushrooms in my cabinet and on the back was a recipe for Mushroom Risotto on the stove top. Challenge, accepted. 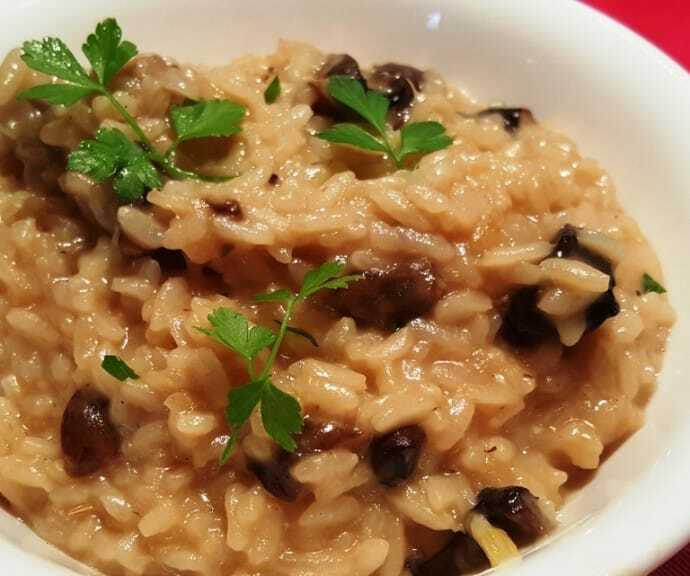 The result was a rich and creamy, very flavorful Mushroom Risotto. 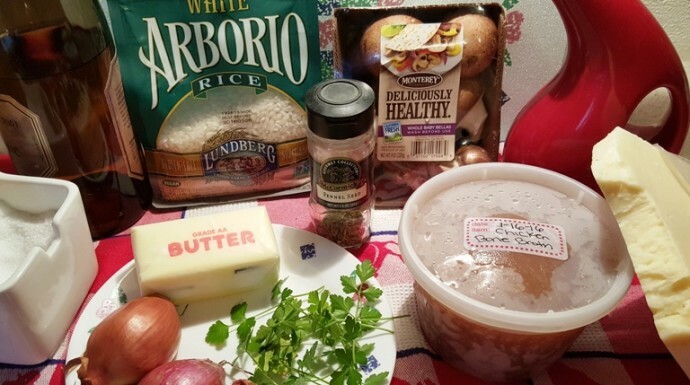 For purposes of this Pressure Cooker Best Wild Mushroom Risotto recipe, I am using Fresh, store bought, Cremini (baby Bella’s), and will write the recipe for both dried wild and store bought mushrooms. Feel free to use whatever mushrooms, wild or otherwise, that you prefer; just don’t choose the plain white, Button mushrooms, as they are flavorless. The Fennel Seeds, really give this Risotto a very special taste. 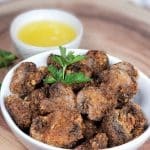 Wild Mushrooms have a very hearty taste (I love morels and porcini), however, plain ole Crimini Mushrooms give a really wonderful flavor. Chicken Bone Broth (vegetarians, use vegetable broth) is great in this recipe. If soaking your dried mushrooms, set aside the cooking water to use in the recipe. If you have none on hand (and why don’t you? 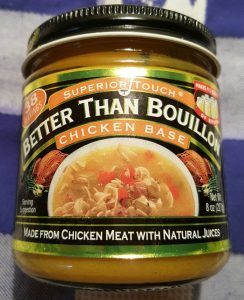 ), then use either a packaged broth, or Chicken Base mixed with water. Have all your ingredients chopped and ready, as things happen fast. When using a stainless steel cooking pot, remember to first heat the Pressure Cooker cooking pot and then add the fat, in order to make it non-stick. After the wine has evaporated, add the liquid, salt and mushrooms to the Pressure Cooker cooking pot and then lock on the lid and cook under pressure for just 4 minutes. Once, you have removed the pressure, continue cooking until creamy and tender but still firm to the bite. Continue stirring and add more broth, just 4 oz at a time. If thinner consistency is desired, add more broth and stir another 2 minutes. When desired creaminess of your Instant Pot Mushroom Risotto is reached, mix in the grated cheese and parsley and add pepper to taste. Garnish with parsley and more grated cheese if you like. Enjoy! 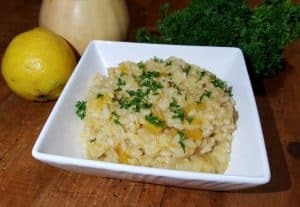 If you love Risotto, try my Roasted Butternut Squash Risotto. More Recipes with Mushrooms to Try. Dried Mushrooms - Place dried Mushrooms in 2 cups of boiling water and let soften for 10 minutes. Using a slotted spoon, transfer Mushrooms to cutting board and coarsely chop. Reserve soaking liquid. Fresh Mushrooms – Clean Mushrooms and slice. Select Sauté or Browning on your Pressure Cooker and allow to heat. Add oil and butter to cooking pot. Add rice, shallots and fennel seeds and stir for three minutes. Add wine and cook until almost evaporated, stirring frequently, about 1 minute. 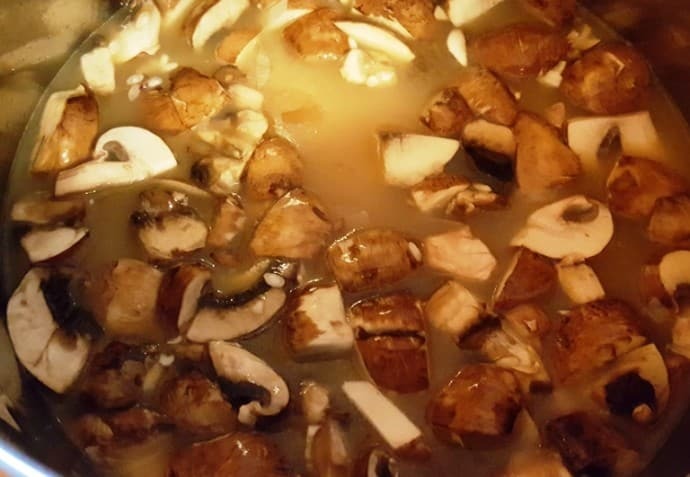 Mix in Chicken Stock and Mushroom Soaking Water (or Fresh Water) (3.5 cups altogether), Salt and Mushrooms. Lock lid in place and close Pressure Valve. Cook at High Pressure for 4 minutes. When Beep is heard, do a Quick Release. Turn Pressure Cooker off and Select Sauté or Browning. Stir rice until creamy and tender but still firm to the bite, approximately 2 minutes. If more liquid is needed, stir in a little more broth or reserved liquid. Add a liquid, a little at a time, until desired creaminess is achieved. Mix in cheese and parsley and season Risotto with pepper, to taste. Fresh Mushrooms, such as Cremini (Baby Bellas), can be used in place of Wild Mushrooms. White Button Mushrooms are not recommended. For a vegetarian version, substitute Vegetable Broth for Chicken Broth. 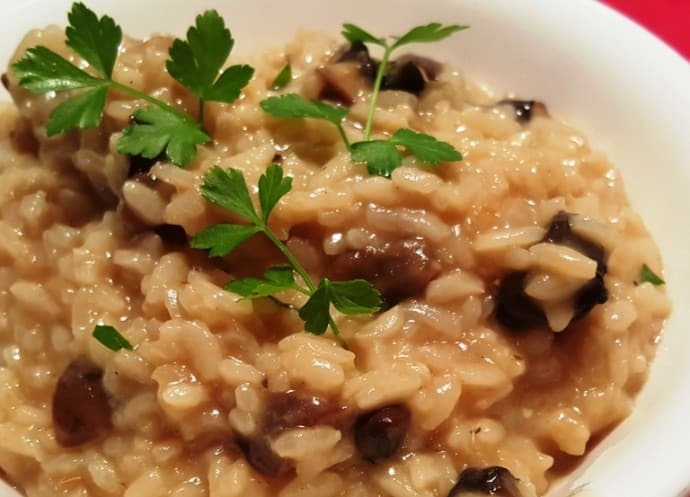 PIN this Instant Pot Mushroom Risotto! Another winner Jill! Used all chicken stock, darn it, I just finished all my white wine the other day, and chopped leeks I had in my freezer, instead of the shallots. Delicious! I am so glad you enjoyed the risotto. It is one of my favorite things to make. 🙂 Good sub with the leeks! This looks amazing did you use crimini or dried mushrooms for this? 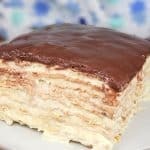 I used crimini in this recipe. I generally use dried wild mushrooms, however Thanks for the compliment. I scored some great dried mushrooms and would really like to make this for company next week. When you say “1 and 1/2 rice cups”, are you referring to the measuring cup that comes with the IP, or do you mean regular cups? Or should I just weigh out 9 ounces? Sorry – I don’t want to waste those dried beauties…Thanks! A “rice cup” is that little plastic cup that comes with your Pressure Cooker. It is about 3/4 of a cup, or 6 ounces. I know it can be confusing. This of it this way. In the morning when you drink your coffee, you are having a cup of coffee in your coffee cup. That cup can be any size. Just because it is called a cup, does not mean it is an 8 ounce measure in a “measuring” cup. Let me know how your Mushroom Risotto comes out. Absolutely awesome! My 6 year old said it was the best dinner I ever made! Thank you for the compliment. I am thrilled your child loved this recipe. I delight in the content on your site. Thanks a ton!. I tried to make this, but when I opened the lid, there was way too much liquids. I had to vaporize it and the got overcooked. I guess something went wrong with proportions. I used the same glass cup to measure rice and liquids. So it was 1.5 cups rice, 3.5 cups broth, 1/2 cup wine, fresh mushrooms. Looks like if I used that small plastic rice cup, it would be even less rice and so even more soupy. Can you give the proportion of broth per rice, so I can just use one measuring cup? 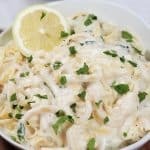 There looks a lot of liquid when it has finished cooking but it is lovely and creamy when it’s stirred and then only a couple of minutes on saute to get the desired consistency. Hi Jill! 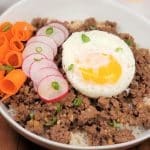 This is one of my favorite instant pot recipes. I have the 8 quart instant pot and I was wondering if the recipe could be doubled? I’ve been experimenting with instantpot recipes since getting on mid-December. 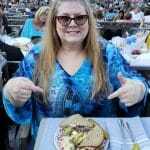 Thank you SO MUCH for sharing your wonderful recipes! I made this risotto tonight and it will remain a staple in my cookbook! 5 stars! Thanks so much. Glad you liked the risotto. It is one of my favs. I’d like to make this recipe for 2. 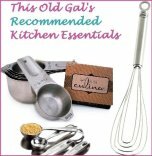 Would I have to adjust the pressure cooking time? Thank you! Cooking time would be the same. Made this last night, following directions exactly and it was fine dining restaurant quality and a worthy side dish to go alongside the pricey (yummy) halibut. Fun to make, too. It was a great tip to have all the ingredients measured and prepped before starting. Will definitely make again! Thank you! Thrilled that you enjoyed this recipe. Thank you for letting me know! Made my day. I know risotto generally means Arborio rice is a must. We have a ton of Jasmine rice int he pantry right now I’d love to use, though. Do you think it might work for this recipe? Hello, what function am I cooking it under “high pressure” for 4 mins? This was absolutely delicious! First time I’ve ever made risotto and it turned out perfectly. Definitely a repeat. I just made this recipe tonight in the Instant Pot after a rough hour in terrible traffic. It was PERFECT. I couldn’t believe risotto could be so easy. It’s so much better than stirring constantly for 30-40 min! Thank you for posting this. Love your recipes and can’t wait for your Book! Oh my gosh! I have been making risotto for years and this was my first attempt with the Instant Pot. I was skeptical about the 4 min cook time and I should not have been. This was amazing. I plan on making more risottos in my IP. So much easier and really yummy! Thanks for the recipe! This was SOOOO Delicious!! I used more mushrooms than called for. I used a combination of dried porcini and shitake, along with probably 3/4 lb of fresh cremini. I’m not a mushroom expert, but one of them was a bit chewy, the shitake I think so I would skip those next time. I pretty much followed the recipe exact, except I accidentally sauted the onions, added some fresh garlic, and the mushrooms altogether. I cooked for 5 minutes. I stirred and it was creamy and perfect!! I went 5 mins because I saw other recipes at 4, 5, and 6 minutes so I picked the middle. I hate when I have to cook longer and get back up to pressure so I chose 5 which was perfect in my pot. I can’t wait to make this again!!!! Do I have to cut recipe in half to make it in 3 quart? This was delicious! I used the Costco grams Padang cheese and it was a great flavor combo. Thanks for the recipe! I planned on trying to adapt a stovetop Seafood Risotto recipe which my daughter makes. I was a bit nervous however because I had never made risotto in an Instant Pot before and I was afraid I might ruin some expensive seafood. 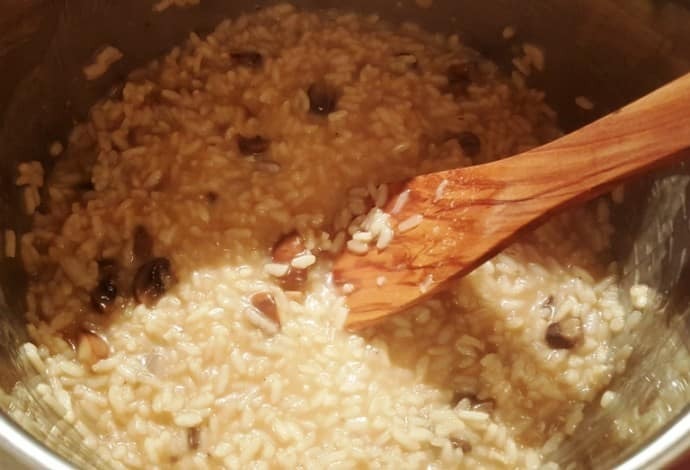 As a result, I decided to try a proven and less expensive Risotto recipe to get the experience of making Risotto in an IP. I chose yours and I am certainly glad I did. I did the recipe exactly as written and the results were amazing, incredible flavour and outstanding consistency. This is now our go to recipe for this dish. After this experience, I cannot picture myself ever doing stove top Risotto again. And the added bonus – I now feel much more confident in having a go at my daughter’s Seafood Risotto in my IP. Thanks for this. Just got the 3-qt Mini Instant Pot (cooking for 1). Can I just cut the recipe in half? I made this last night with minimal tweaks to the recipe – used beef broth, finished it with some cream – and it turned out beautifully! I hadn’t seen the comments and used regular measuring cups for solids & liquids and it still came out perfect. 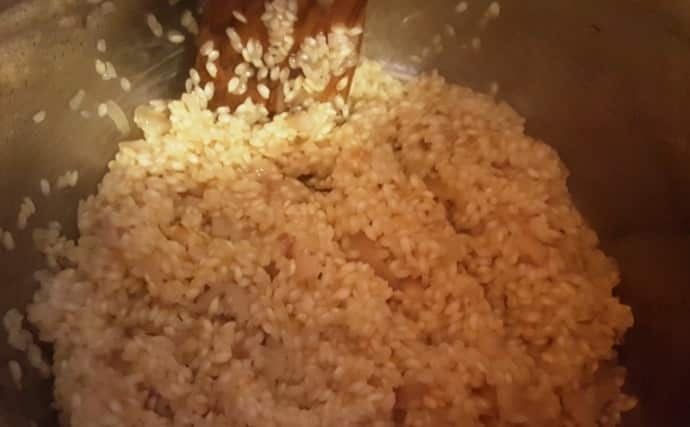 I have made many traditional risottos so know what they’re supposed to taste/look like. 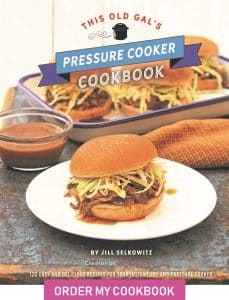 I won’t ever waste time and energy again and will make Jill’s recipe instead!!! Thank you for another keeper, I specifically come to your blog/FB page instead of doing a Google search when looking for a new recipe now.